Since we've been here for over a week (8 days as of this writing), we've seen much of the downtown Papeete waterfront area. In the mental background of all of these photos and events is the search for our repaired or replaced injector pump, of course. 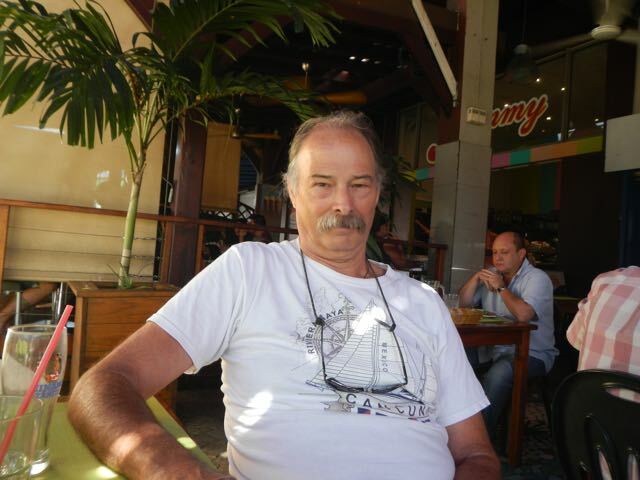 Meantime, we're trying to see and enjoy as much of Papeete and Tahiti as we can. 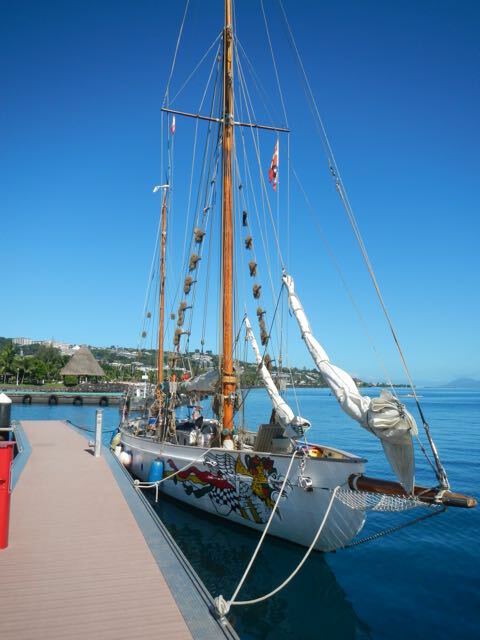 Wings rests in her new spot at the transient dock at Marina de Papeete. As you can see, we're directly across from the huge commercial vessel loading docks of Papeete, visible at right. Just around that far corner at right is the pass through the reef that forms the entrance to the lagoon, and Moorea is on the horizon in the background. Yes, I did. 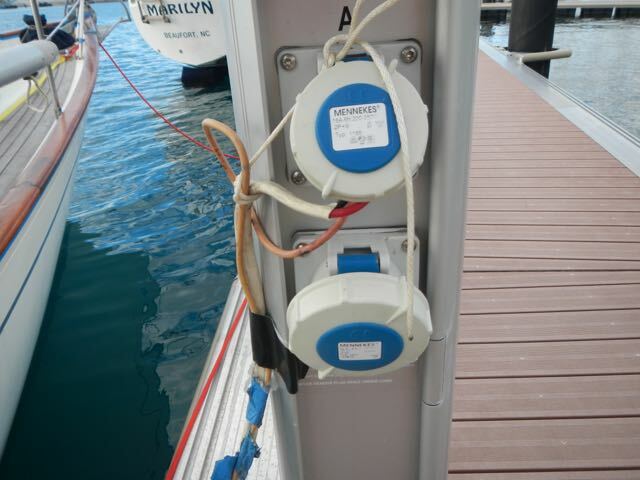 I had no French marine plug for the shore power so just snipped off the connector that I had and jammed the wires into the socket. But I used the ground, too! I tied and taped the wire to the pedestal and we've had no problems with it at all. One and all, this is not my usual work. 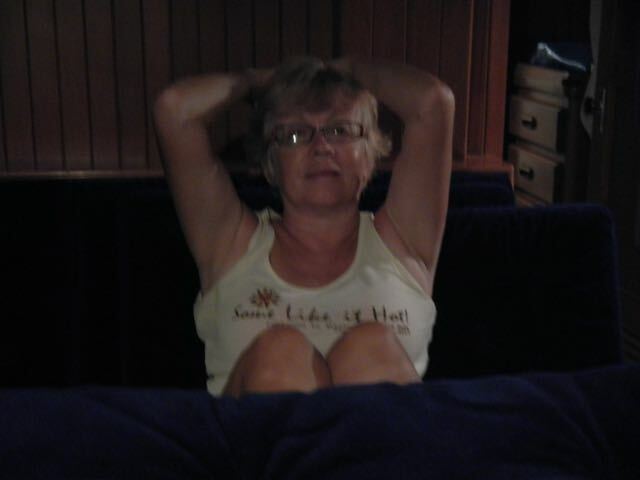 No one from the marina has said a thing but one of our fellow cruising pals grinned and said, "well THAT'S old school . 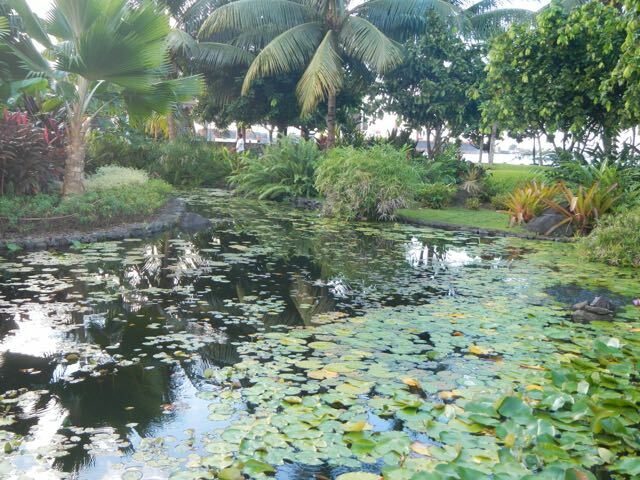 . ."
Lush vegetation planted in the extensive public park that runs along the marina and lagoon front. 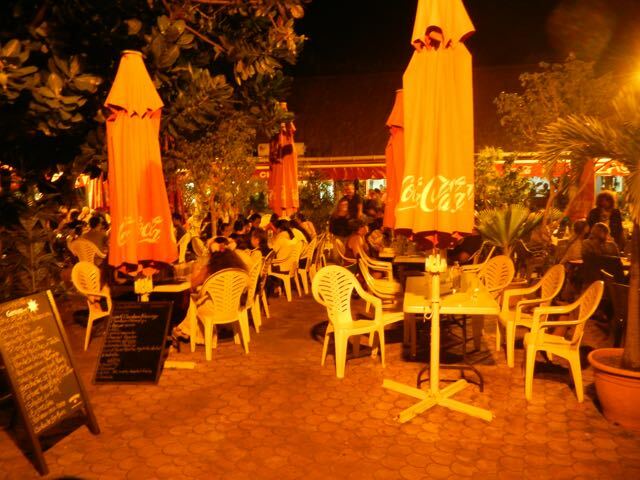 There are walkways, playgrounds, benches, ponds, a short work-out course, sidewalk cafes, and the locals use it all day and all evening long. 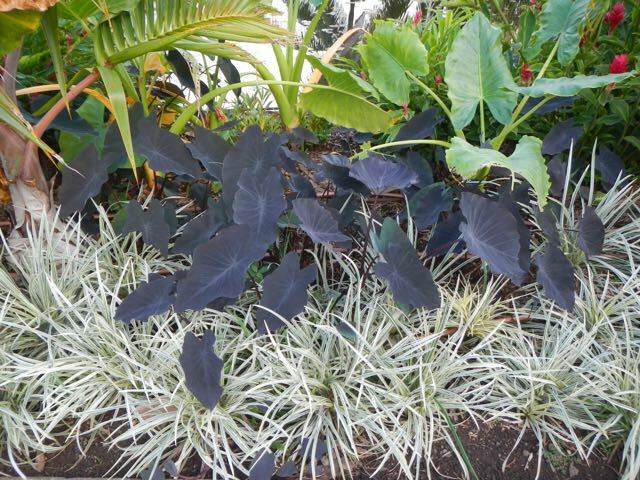 These leaves look like a philodendron but we've never seen one in this gorgeous purple color. 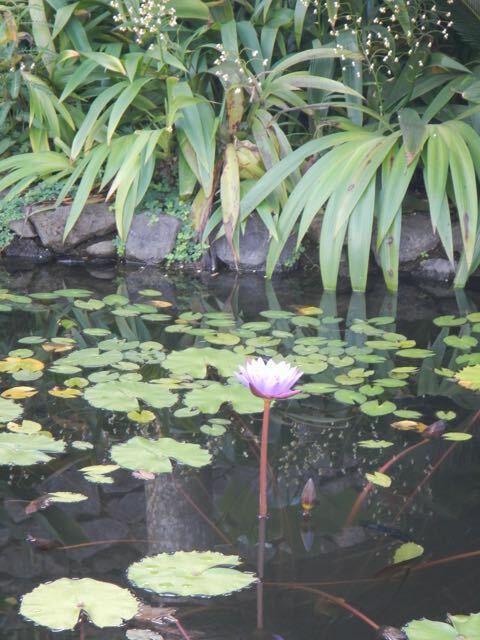 One of the ponds with a beautiful lavender lotus blossom poking out of the water. Another shot of the waterfront park. 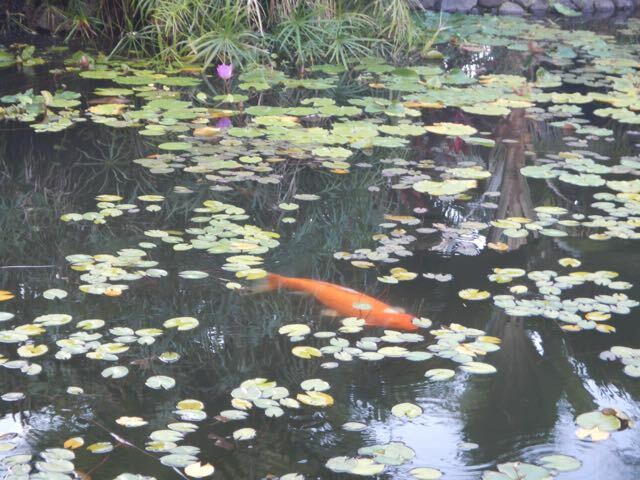 We saw many smaller fish in the pond, and then this impressive coi came into view. This guy is easily 16 inches long. 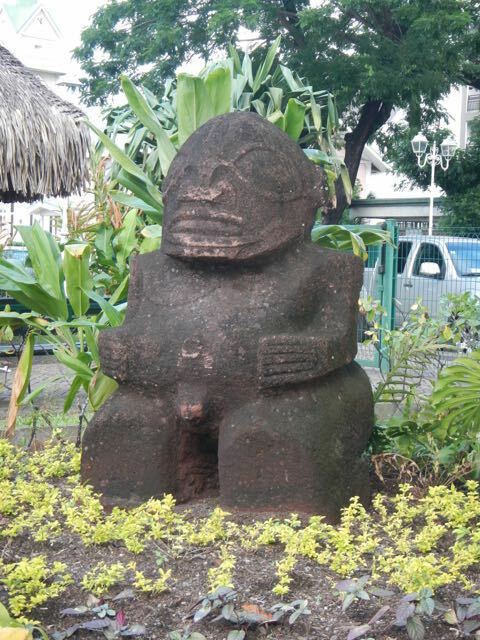 A more-than-human-size tiki in the park. Hmmm...we think that it's male, too. 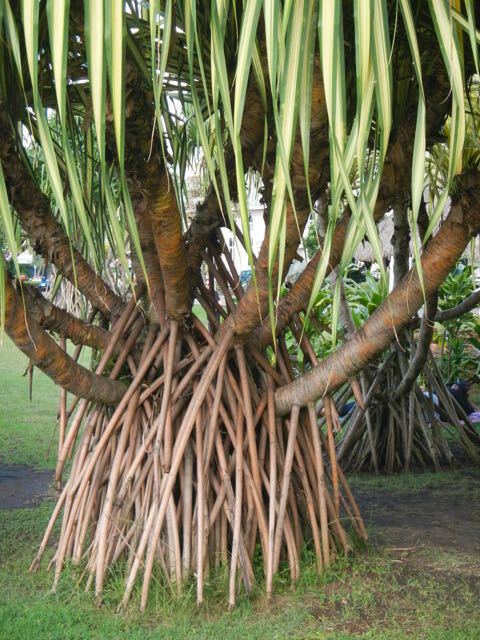 More beautiful, unusual tropical vegetation in the park. Neither of us has a clue what this tree is. We have no idea what the message is here, but this is on the wall of an apartment block roughly across the street from a large Protestant church. 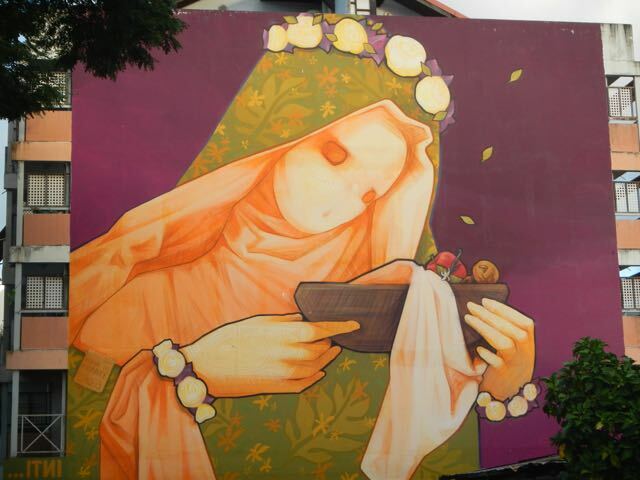 It looks like a Madonna and....what? A bowl of tiki-headed baby Jesus? Even we think this is odd. The Jesus figure in the bowl, if that's what it is, is distorted: malformed, off-colored, and tiny. We don't know what to think about Mary's skeletal face. There's a tiny sign on the Madonna's shoulder in the lower left that reads, "Made in France". Hmmm - a little social commentary about the influence of the missionaries on local culture? 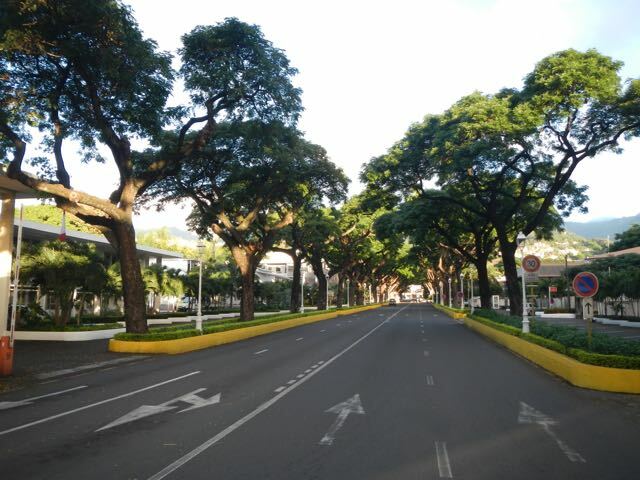 This is one of the main boulevards in Papeete that run perpendicular to the lagoon, and it's so French, isn't it? It's wide and tree-lined, like many in France. Conni resting in Wings. Those are her knees, by the way. Nordkaperen is a 111-year-old, steel-hulled and decked boat from Denmark, and reportedly one of Denmark's more famous old sailing vessels. She's flush decked (no raised cabin top or place to hide from the weather.) She's gaff-rigged. 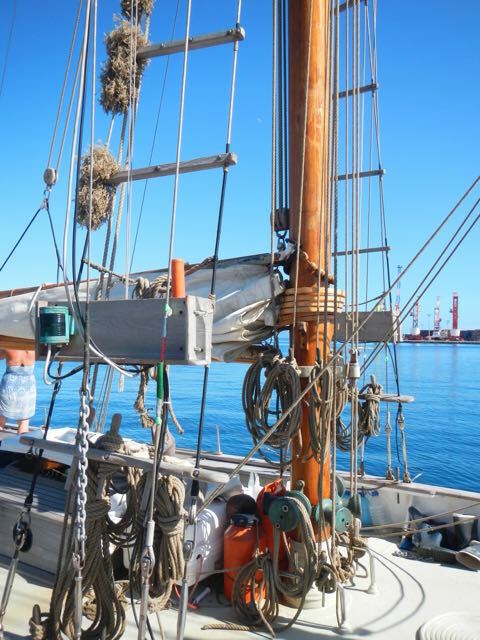 She's more of a traditional schooner than any that we've seen. 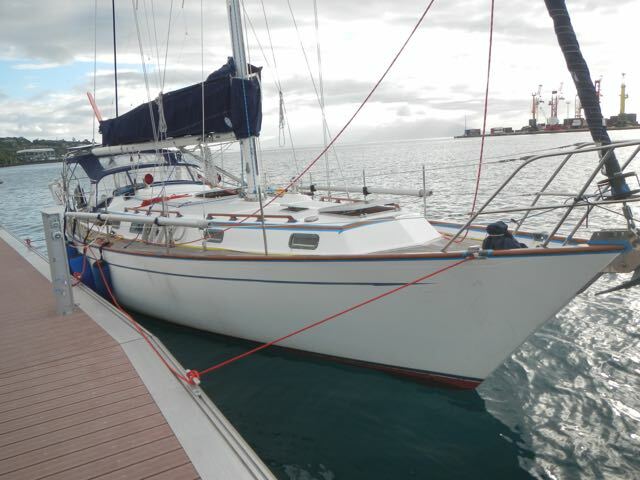 The odd fuzzy things on her stays are called "baggywrinkles" and are hand-made anti-sail-chafe devices. Nordkaperen's steel deck and traditional wood masts. Note her wooden blocks and belaying pins. This is one salty boat! 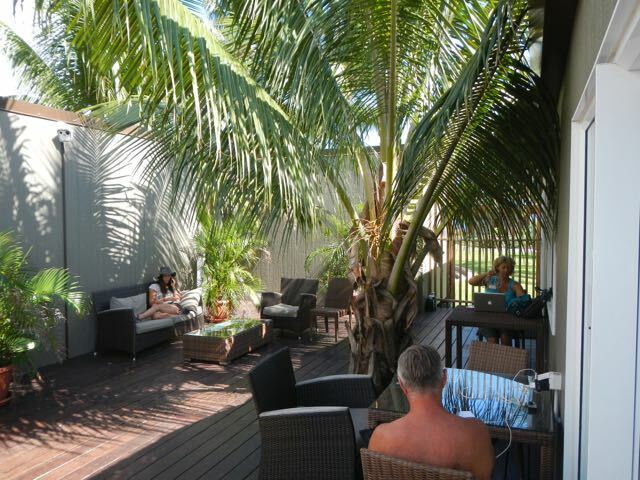 Marina de Papeete's private outdoor lounge area. Men's and women's restroom facilities are at left, including the cold-water showers. A Wifi hotspot is sometimes available at no additional cost, although it's been down for three days as of this photo. We enjoyed a fine lunch at Patachoux, a well known and highly rated outdoor cafe that we remembered fondly from a couple of years ago. This street is full of cafes that are open for breakfast and lunch and then close for the evening. This is a well-fed Bill after a huge hamburger, fries and Orangina! 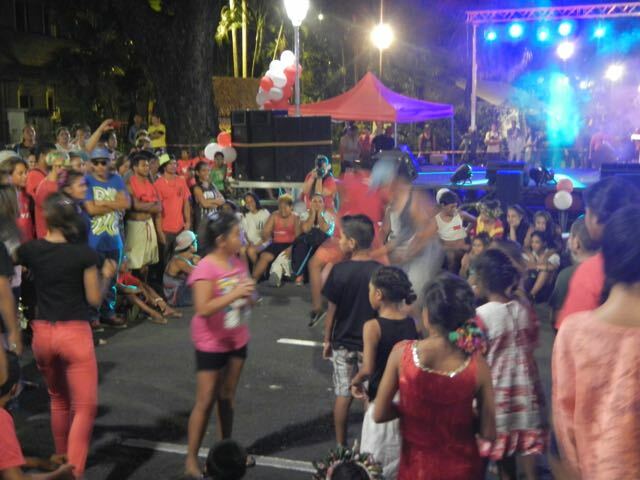 The July 29 Autonomy Day celebration: sounds like Tahiti became free of something, doesn't it? Nope, the day actually celebrates the loss of autonomy, when Pomare V, the last Tahitian king, ceded Tahiti to the French in 1880. After an afternoon parade, the main waterfront street was closed for the evening, a stage set up, big speakers and a great DJ brought in, and the dance party started. 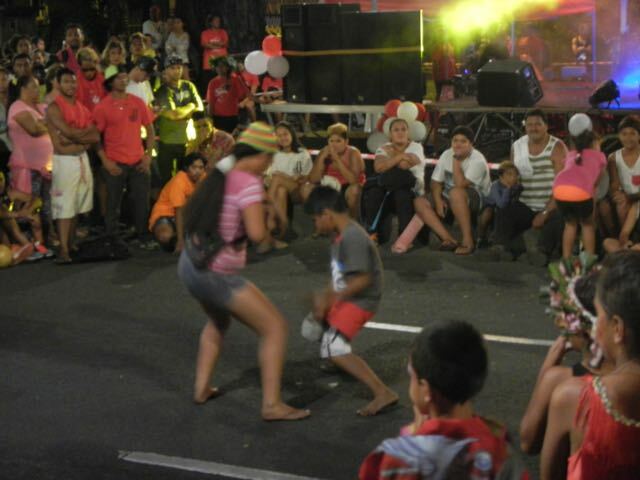 Hundreds of people, mostly teenagers, gathered for impromptu dance competitions. 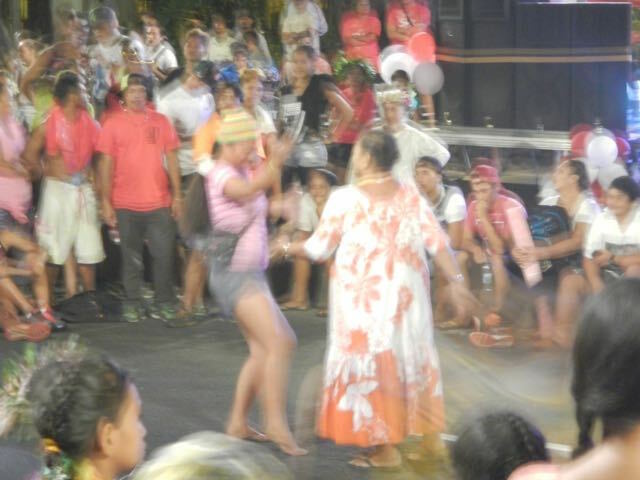 The kids were feeling shy, so these two middle-aged ladies were shaking a leg to the beat of (very loud) electronic dance music. Everything from Diplo and DJ Snake to Pitbull. Well, not to be outdone by the old folks, the teenagers started getting their Tahitian groove on. This pair includes a very young male and a teen-aged female. Fair to say that young men are the same the world over. 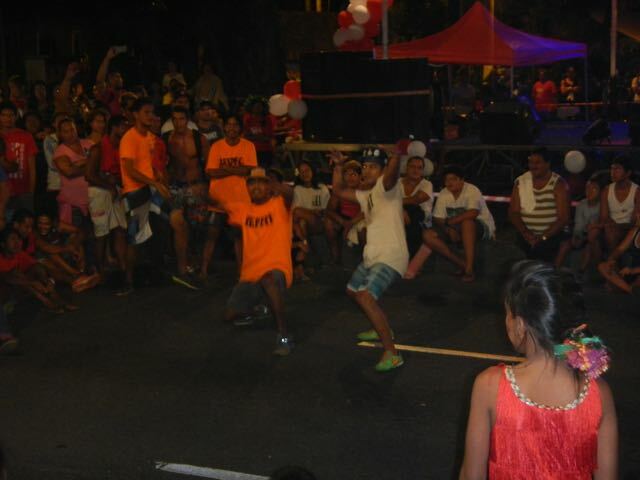 This group of friends in orange obviousy dressed as a team and had a little fun showing off their moves. 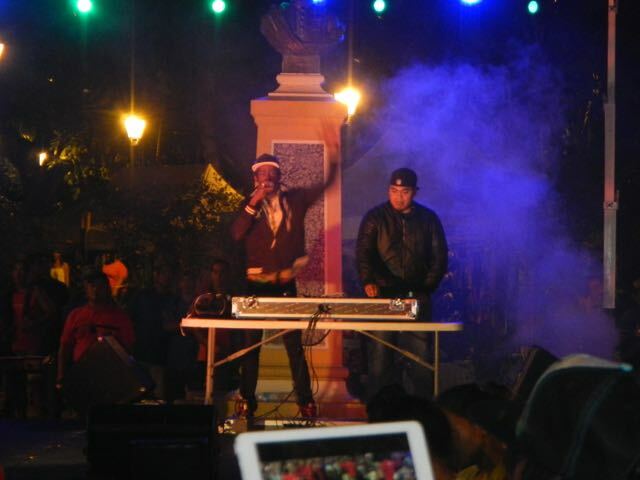 The gentleman on the left was the main DJ, and kept the street party going in fine style. More of the street party scene. 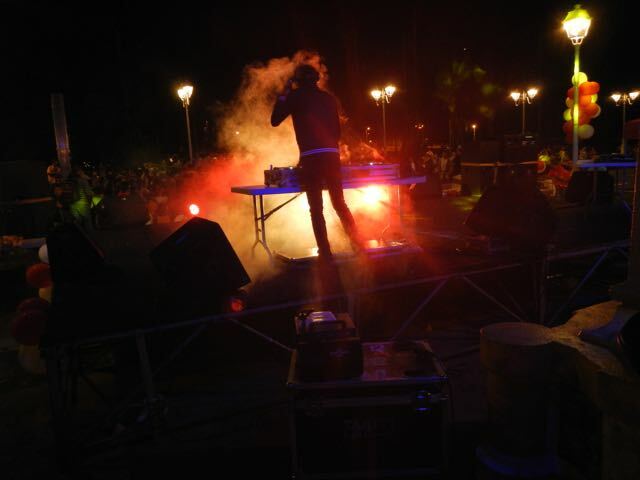 We walked around the block and got this shot of the DJ (and his fog machine) from the back. We mentioned the sidewalk cafes in the waterfront park. Here they are - about 5 of them in a row, and they all share this outdoor table space for customers. They're open from about 11:00 AM - 1:30 PM for lunch, then again from 6 PM onward for dinner. We had a fine meal of Tahitian/Chinese food. By the time we left about 8:30, there wasn't an empty table in sight. The sodium lights they used for illumination colored the photo. Conni was awakened at first light by a low rumble and looked out to see two tugs slowly spinning this very large cargo ship so she could be docked bow out at the commercial dock across the lagoon. There's been a steady stream of cargo ships loading and unloading at the dock, but this one is by far the largest. It's come a long way - through the Panama canal from Germany. 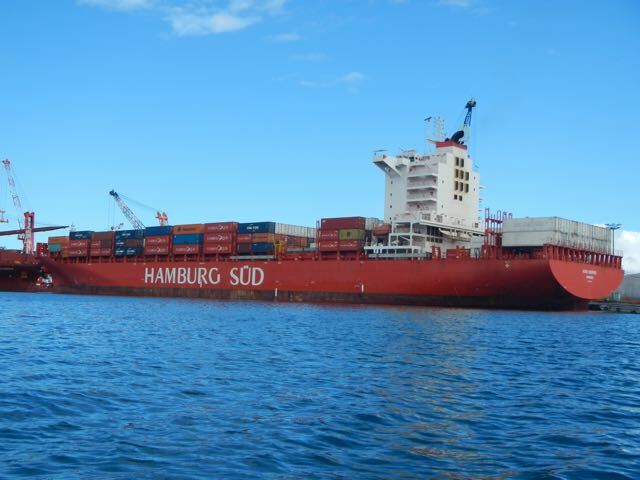 Remember that the containers are the trailers for our trucking industry, and there are many hundreds on this vessel.